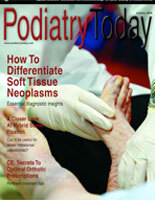 Chronic posterior ankle pain is a very difficult problem for foot and ankle surgeons. Given the multiple potential tendinous and osseous causes of pain, doing a proper diagnostic workup is essential for proper care. With this in mind, let’s consider the following case of a 52-year-old Caucasian male who presents with chronic pain and weakness of the posterior ankle. A computer salesman with an avid love for golf and tennis, the patient plays tennis on the weekends and golf at least once a week for business. Approximately two months ago, while playing tennis, he began to feel pain in the posterior right ankle region. He says the pain was worse in the morning after playing tennis, but would improve with some stretching and walking. He also notes that the right posterior ankle had developed a posterocentral mass that would get better with rest and would increase in size after a great deal of activity. About one month ago, during a competitive tennis match, he felt pain in the posterior ankle. While he is unclear as to when the pain occurred during the match, he felt a sharp pain and then had difficulty with ambulation. He continued to play for a couple of points, but could not finish his match. He went home and placed ice on his posterior ankle. He wrapped the ankle with an old Ace wrap and took 600 mg of Motrin three times per day for the next five days. The following morning of the injury, he felt a different pain than his usual tightness or soreness. He had a weakness upon ambulation and swelling of the posterior ankle. For the next 10 days, he tolerated some mild pain and swelling of the posterior ankle. He saw some decrease in swelling, yet he felt mild weakness during ambulation. About one and a half months after the initial injury, he returned to play golf with some clients and felt very weak with his stroke during the finish of his swing. The right ankle was again swollen, yet he had minimal pain in the region. He notes no significant past medical history except for asthma. He does not take any medications except his asthma medication, as needed, and short bouts of Ciprofloxacin as needed for upper respiratory infections, which he gets once or twice a year. The physical exam shows a healthy and trim male with no acute distress. He has well developed lower extremities with no signs of poor muscle development. The neurological examination shows no loss of sensation on the sharp/dull and vibratory exam. Protective threshold is also intact with no region of lost sensation. The vascular exam shows bilaterally symmetrical pulses which are bounding in the posterior tibial and dorsalis pedis as well as the popliteal regions. A dermatologic exam of the patient shows mild edema of the right posterior ankle and thigh region with the majority of the edema in the posterior aspect of the lower extremity. There is no break in the skin of the right leg and no signs of bruising or hematoma. The muscular and skeletal examination reveal mild tenderness of the posterior ankle and distal posterior quadrant. There is pain to palpation of the Achilles distally about the insertion and slightly proximal to that region. There is no gross deficit in the region of the watershed area in the Achilles tendon. There is three out of four muscle strength with general examination of the posterior muscle group and Achilles with the patient seated. Although there is a gross gastrocnemius equinus in the left ankle, the right ankle is easily dorsiflexed to 90 degrees with the knee locked and bent. There is minimal tenderness to dorsiflexion of the ankle. Palpation of the deep posterior ankle is difficult due to some swelling, yet there is no deep pain present upon testing it. Range of motion of the ankle is non-painful and there is no discomfort of the peroneal or posterior tibial tendons. The Thompson’s calf squeeze test is intact, yet is weak to testing. Posterior quadrant pain is likely to be due to one of several potential causes. Commonly, flexor hallucis dysfunction is associated with chronic pain that increases after activity. The pain is essentially present at all time and there is no feeling of weakness. There is pain upon dorsiflexion of the hallux and palpation of the posterior ankle. Gastrocnemius injury is common in tennis players and those who participate in jumping sports. However, the region of pain is often much more proximal on the lower extremity than the ankle. The region of pain is mainly at the tendinous junction of the gastrocnemius muscle. Most injuries are not from a chronic cause, but from a overstretching of the tendon with a plantarflexed foot position progressing rapidly to dorsiflexion. Patients who have osteochondral lesions may present with different kinds of pain. The most common pattern of injury is a rotatory force to the ankle such as an ankle sprain. However, a crush type injury, such as landing on a flat foot with high force, may cause chondral injury and pain in the associated joint. Common patient complaints include chronic swelling and ankle pain. Swelling is often mild and minimally noticeable. These patients may notice locking or weakness of the ankle from time to time and there is usually a deep joint ache with heavy activity. A Shepard’s fracture of the posterior process of the talus is also associated with an acute injury. Patients will feel pain following the acute injury, which is often a forced plantarflexion of the ankle that causes the posterior talus to get crushed between the calcaneus and posterior ankle. Patients may experience pain with range of motion of the flexor hallucis tendon during dorsiflexion of the hallux and they will also have pain upon direct pressure to the posteromedial ankle. The region of pain is usually chronic and worse with sports, yet weakness is not common. In the above case, the most common and likely cause of pain is an acute Achilles rupture in a patient who has had chronic Achilles tendonitis/tendinosis. With increased stress on the Achilles during activity, there is bulbous enlargement of the tendon and multiple tears within its substance. Over time, the tears are replaced with scar tissue, decreasing the elasticity of the tendon. Following an acute overexertion of the tendon, there is a complete tear, which may not result in the same level of pain as in common acute tears. The lack of pain is due to the chronic partial tears in the tendon, weakening it to such a point that a complete tear does not require the same force as in a normal tendon. Remember, the essential factor, in cases of chronic Achilles tears, is there is not likely to be a palpable defect or positive Thompson’s calf squeeze test as the region of defect may partially heal with poor quality tendon or scar formation. Therefore, diagnostic testing is essential for proper treatment. The ideal test in cases of posterior ankle pain is magnetic resonance imaging (MRI). A gastrocnemius tear, flexor hallucis stenosis and osteochondral lesion are often visible as is an Achilles tear. You can also see a fracture of the posterior process of the talus, but you may also partly diagnose this with radiographs and examination comparison. Treatment of chronic Achilles tears has changed in the past few years. Previous treatment options included v to y lengthening of the gastrocnemius tendon and fill of the gap, and surgeons have also performed turndown procedures of the gastrocnemius tendon. In theory, a turndown procedure will bridge the void in the torn tendon region and allow for function of the calf musculature. However, the patient is not able to retain full strength and there is often a feeling of weakness associated with the repair. Today, the best procedure seems to be a flexor hallucis tendon transfer to the calcaneus with or without fill or the gastrocnemius gap with a turndown procedure. Performing a flexor hallucis transfer augments the power of the Achilles tendon following rupture and allows for better function of the calf complex. The repair also does not compromise function of the flexor tendons as there is crossover power of flexor digitorum and hallucis tendons at the midfoot plantar arch level. Posterior ankle pain may be commonly associated with several causes. Differentiation is often subtle, but essential for proper care. Often, a MRI is an ideal test that can give you critical information when you combine it with a thorough physical examination and history of ailments. Dr. Baravarian is an Assistant Clinical Professor in the Department of Surgery/Division of of Podiatric Surgery of the UCLA School of Medicine.